Arthur Dallas Stenger better known as A.D. Stenger is perhaps one of Austin's better known residential architects, an impressive feat for someone that dropped out of UT prior to graduating. A.D. Stenger was not one to follow the traditional path however. He was innovative, had strong opinions and wasn't afraid to do things his own way. In 1950 he passed his architectural exams just prior to graduating the University of Texas School of Architecture. 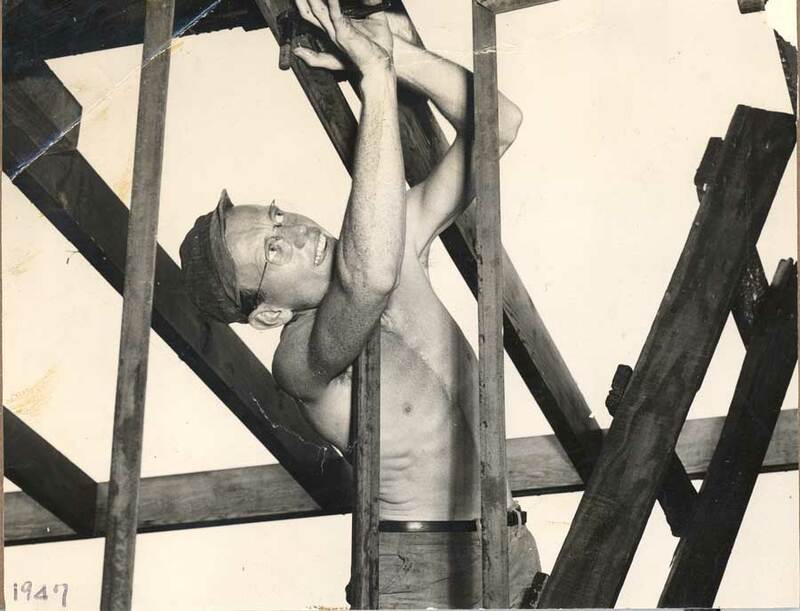 The demand for post war housing was high, and he was ready to work. Stenger was more than just an Architect however, he also a builder, and a successful entrepreneur. He has been often compared to Eichler who during the same period of time was busy developing large modern subdivisions in California. While the comparison is a fair one, Eichler and Stenger do have several large differences. First off Eichler was not actually an architect at all, just a savvy real estate developer who employed multiple architects who designed very similar houses for him. Eichler often times used exact floor plans of houses next to each other simply switching up orientation and rooflines to make them look unique. Stenger on the other hand built his houses one at a time often working on them himself. While there were occasional duplicates, the vast majority of the over 100 homes he built in the Austin area were completely unique. We find the highest concentration of Stenger homes in three neighborhoods he developed, South Lund Park, Ridgewood Village and Stenger Addition. These areas were picked by Stenger as they were originally outside of city limits, giving him less restriction as to what he was able to build. I have compiled a list of 50+ A.D. Stenger homes in the area and keep a close eye on them. If you are interested in purchasing a Stenger home please contact me. Alternately if you already own an A.D. Stenger home please consider joining the A.D. Stenger FB group to connect with other owners in the Austin area. What does aN A.D. Stenger designed home look like? And a few that have recently been listed on the MLS. I’ve been tracking this updated A. D. Stenger home for a while now, and I had an opportunity to walk through it this morning. Let me just say that it does not disappoint. Hat tip to the current owners who so respectfully updated the home. This is one of the biggest A.D. Stenger homes thanks to an addition in the mid aughts. We’ve seen it for sale before but it looks like a pool has been added since the last go around, and a handsome one at that. Honestly, I'm not sure if there is anything better than a well updated mid century modern home. This one was designed and built by A. D. Stenger in 1960 but received a complete remodel in 2016. That fireplace as a centerpiece for the room really makes me wish people still put fireplaces in homes. I shared this one on the A. D. Stenger FB page back in Feb. Admittedly it's pretty had to see what's going on here, so let me paint a picture instead. Designed and built in 1951 by A. D. Stenger this house sits on over 1/4 acre and has a 3 bedroom 1,300 sqft main house and a 419 sqft garage apt. Yes it needs work, but it looks like it has potential. Boom! And just like that there are two Stenger designed homes for sale. This one takes a bit of squinting and imagination but there is plenty good there. It's been in the same family since it was new in 1958 and aside from closing in the carport it looks like it's still mostly original. It seems like it's been a minute since there has been a A.D. Stenger designed home on the market. For those not familiar with Stenger, make sure you read up on him here, and if you want you can join the Stenger FB page here. This particular home was built in 1965 but the interior has seen a complete update recently. The house isn't the most imaginative that Stenger built but it does a great job checking the essential MCM boxes. Vaulted ceilings, check. Natural materials, check. Strong indoor outdoor connection, check. The tree filled backyard and free form pool aren't to shabby either. Ok, this one takes a bit of vision. It was reportedly the home of AD Stenger at one point. It's had a few updates, most of which have been tasteful (new cork floors) and some less so (please tell me that is a shed in the front yard and not an addition). Overall it's a great looking house with solid architectural pedigree, and a great price for the area. This one is a blank pallet with good pedigree. Designed and built by AD Stenger in 1960 it's everything you could want in an architect designed mid century modern house. It's got terrazzo, and an awesome funky fireplace and best of all no one has done a lousy remodel to it yet. Make sure you check out my little feature on it here to see interior photos I snapped a few days ago. According to the current owner of this house it was originally built by A.D. Stenger but designed by Earl Nesbitt (who worked for Page Sutherland Page before opening his own firm in Austin). I've never heard of Stenger building other architects designs, but I have heard that he was building into the 70's and 80's so I suppose it's plausible. Not on MLS. Contact me for info. If you read my newsletter, you know I've been teasing about some off market Stenger homes for a bit. I had the pleasure of walking through this A.D. Stenger designed and built home a few weeks ago and meeting the owner. It's in incredibly original shape and has been lovingly preserved. All it needs now is another owner to love it the way it has been for the last 58 years.